Larry Troyer, Duncan Aviation Avionics Instrument Tech Rep, troublshoots the two most common causes of APS-80 Autopilot System failure. The autopilot / flight director system is a complicated system that is common in aircraft from light twins to corporate jets. The FGC-80- (Flight Director) processes all lateral/vertical signal inputs depending on the selected mode. It controls the position of the command bars in the Flight Directory Indicator and sends commands to the APC-80. APC-80 receives and processes commands from the Flight Director computer and passes them on to the APA-80, which drives the individual servo motors to control aircraft flight. Most likely cause is the APC or APA. These computers have multiple internal dc power supplies that tend to get out of tolerance or fail completely. They can be temperature sensitive (hot or cold) failing at one specific temperature. If you are able to duplicate the discrepancy on the ground, it is possible to isolate the faulty computer by heating or cooling each box individually. Engage the autopilot on the ground and manually override the controls in pitch or roll. If the autopilot disconnects, the most likely cause is in the APA due to faulty torque monitors. When the autopilot won't engage, the APA and APC is still most likely the cause. However because of the extensive internal computer monitoring, there are many other things that could be contributing to the failure. When activating the lever to engage the autopilot, the system automatically initiates a self-test routine. During this self-test a dc voltage is sent to the two NAC-80 accelerometers that in turn generate a fixed signal back to the APA. A correct signal is required to successfully pass the self-test. 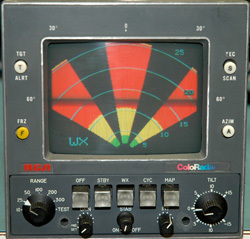 The NAC-80s also put out a valid flag which is monitored in the APP-80 control head as a condition for engagement. If you have access to a breakout box or logic monitor it helps to isolate the problem down to a box or aircraft problem. Other wise the majority of the times engage problems are caused by either the APC-80 or the APA-80 computers. Spoking is a general term used when a radar system fails. You can determine which part of the system is causing the problem based on what appears on the radar display. The most common type of spoking is caused by the magnetron or local oscillator. This occurs when they lose lock and do not track with each other. This will typically appear on the radar display as a pie shaped patch and will only be present if there is weather to be shown. This would be a receiver transmitter problem. Another type of spoking comes from the antenna and is caused by noise from the sweep resolver. This will normally show up on the radar display as a very thin line that will start at the apex of the screen and continue to the edges, no matter which range you are on. This will almost always appear in the same spot on the screen. Intermittent connections on the antenna can also cause the antenna to pitch up or down causing spikes or humps within the return. This is a common problem for the Primus series of antennas. Also remember, the winter season is a great time to get your radar unit tested and ready to go prior to spring, when thunderstorms are more prevalent and radar is used most. Take advantage of Duncan Aviation’s Winter Radar Promotion and get $100 off radar servicesincluding functional checks, evaluations, repairs and overhauls through March 31, 2014. To redeem, print and include the $100 rebate with each radar unit shipped. If you have questions about your radar's operation or how environmental testing will help your radar's reliability, contact Duncan Aviation avionics tech reps.
Honeywell BA141 Altimeter and Air Data Computer. Honeywell BA-141 altitude indicators and SI 225/285 airspeed indicators are avionics units common to a variety of jet aircraft. When these units are sent in to Duncan Aviation for repair, one of the most common squawks reported is pointer jitter. Pointer jitter occurs when the indicator's pointer oscillates or vibrates and does not give a clear reading. This squawk can be caused by a dirty sycho, defective potentiometers or power supply capacitors that get weak over time. If the pointer jitters badly enough, it can and does cause a flagging issue during flight. It is a very simple process to troubleshoot altitude and airspeed indicators if you have a spare indicator available. 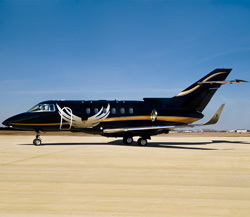 If you do not have a spare indicator, Duncan Aviation has a loaner available. Replace the suspect unit with a spare unit. If the problem goes away, the indicator is faulty. If the problem remains, the fault is elsewhere, most likely with the air data computer (ADC). Both the altitude and airspeed indicators provide valuable information to the pilot, but cannot function on their own. They are fed the information from the ADC and in turn report the appropriate information to the pilot. It is not uncommon for these indicators to be blamed for a squawk that resides in the ADC. When sending the units to Duncan Aviation for repair or overhaul, it is always a good practice to send both the indicator and ADC together. This allows our avionics technicians to identify the cause much quicker and act accordingly. Every unit sent in will be inspected for cleanliness, damaged or broken parts and loose screws. It is put through a full function test that includes inspection of the lights, wiring and electronic components. 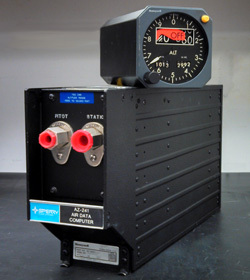 If you send Duncan Aviation your Honeywell BA-141 altitude indicator and your air data computer at the same time, we will certify and return them with an altitude correction card. We must have both the ADC and the BA-141 altitude indicator in order to certify and return with an altitude correction card. Duncan Aviation is the only Honeywell Authorized Service provider for these units. If you should have any questions regarding these units, don’t hesitate to contact me. 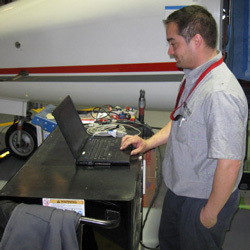 To schedule a repair or overhaul event, contact any one of our Duncan Aviation avionics customer account reps. It is not uncommon for me to receive a phone from an operator flying with a TFE731 engine asking me to review their engine downloads. After several flights the engine computer light begins to flash and the only fault they can see is fault code 237, ECTM Buffer Filled. They want to know why they are getting this. In all cases after reviewing the engine downloads, I found they all have an uncommanded engine shutdown logged. This triggers an event record, which in turn causes the engine computer light to flash. What causes a fault code 237 on engine start up? An uncommanded engine shutdown occurs during engine start when the throttle is brought out of cutoff and advanced past the idle position and then back again. This causes the uncommanded engine shutdown to be recorded in the DEEC and causing the computer light to flash. To prevent an unnecessary engine download, cautiously bring the throttle from cutoff to idle without advancing it past idle. Our experience has taught us that a commutator and brush reconditioning program will extend the life of your armature and brushes. 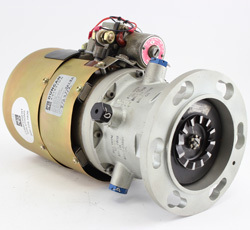 Technicians in the Duncan Aviation Accessories shop, recommend a reconditioning program for the Lear/Bendix starter 6608268-6 on Learjet 35/55 aircraft. The reconditioning of the armature commutator and re-seating and re-run on the brushes every 800 hours (maximum) will divert armature commutator damage. In cases where the armature commutator and brushes are not reconditioned, the commutator will become pitted and burnt from the diminishing electrical connection to the eroded brushes. This armature commutator damage will progress to the point of mica electrical breakdown (mica is an electrical insulation between the armature commutator bars). This mica breakdown is non-reversible in most cases, and the armature must be replaced. A common symptom that this is occurring would be the engine is slow to spool at engine start. Scheduled to open later this summer, Duncan Aviation will open its newly refurbished Accessories Shop in Lincoln, Nebraska, that will more than double the footprint of its service area. The Accessory department will gain approximately 6,300 square feet of service area, double its work benches and add new tooling and in-house capabilities, including an overhead crane and a new paint booth with curing room. To read more about the Accessory department expansion and added tooling, read the Spring 2013 Duncan Debrief. These expansions come in response to customer requests and changing customer needs. As the industry continues to shift toward larger business aircraft, a trend fueled by technological advances and increased globalization, Duncan Aviation’s new expanded shop areas will be able to accommodate the volume of maintenance, modifications and completions work our customers require. Asking the right questions at the right time, will lead you in the right direction towards a solution when troubleshooting an autopilot squawk. Figuring out the cause of an autopilot (A/P) squawk is more involved than just looking up the symptoms and determining a course of action. It involves a rather complicated decision tree that includes several steps and scenarios. Altitude Hold INOP is a common A/P squawk that we encounter nearly every day. Below are some of the basic questions we ask that lead us in the right direction towards a correct solution. Does the Altitude Mode show engaged? If the altitude mode does not show engaged, the next step is to determine if the fault lies with the flight computer or air data. There are two main things required by the Flight Director (FD) computer in order for the Altitude Hold Mode to engage: 1) Mode Select voltage, and 2) Valid logic from the Air Data Sensor. If both signals are being transmited correctly to the FD computer, you can assume the FD computer is faulty. Does the A/P drift off altitude? If the A/P is drifting off altitude, first determine of the flight command bars are responding appropriately. For instance, if the A/P drifts off the altitude and the flight command bars do not recognize it and give the command to correct, the altitude error from the Air Data Sensor is not getting to the flight computer. This could be a faulty Air Data Sensor or FD computer. If the error can be confirmed as having reached the FD computer, then the computer is faulty. However, if the flight command bars respond with corrective action when the A/P drifts off but the A/P doesn’t respond, I would took into the A/P amp or its connection to the FD computer. Another thing would be to check the Auto Trim. If the Auto Trim does not come in and take the effort away from the elevator servo after initial correction, the servo may run out of authority to hold the correction and allow the aircraft to drift off. Does the A/P “hunt” for the altitude? If the A/P hunts for the altitude, this could indicate either an altitude hold or pitch channel problem. Even though it may appear to be only an altitude hold failure, we need to remember in altitude hold, the A/P is trying to hold a tight reference of altitude against pitch attitude input. A pitch failure could be caused by any number of other parameters that will appear more often during altitude hold, due to the tight reference. As you can see, there is no obvious answer to an Autopilot Altitude Hold INOP squawk and these questions are not all-inclusive. We haven’t addressed cable tensions or servo motors. When troubleshooting Auto Pilot squawks, don’t be discouraged if the answer isn’t obvious. Lear more about Basic Autopilot Troubleshooting from Curt and Larry as they present at the 55th Annual AEA International Convention and Trade Show in Washington, D.C., from April 3-6, 2012. Curt Campbell and Larry Troyer are Duncan Aviation Avionics Tech Reps. located in Lincoln, NE, specializing in troubleshooting squawks and offering tech support for business aircraft avionics. Curt's aviation career began in 1975. Larry's aviation career began in 1982. 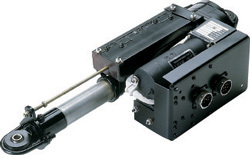 Isolation diode shorts in the stab actuator can disengage the autopilot. Last week I received a call from Carter Hart of Airframe Service, who was working with an autopilot problem. The autopilot would engage properly, but would immediately disengage as soon as the pitch servo tried to drive the elevator. The autopilot computer had been sent to the factory but was returned with no fault found. Through several telephone conversations, Carter and I concentrated on the autopilot pitch trim operation and troubleshot the aircraft wiring, and measured voltages and verified logic conditions in the aircraft. This process led to the discovery of a shorted diode internal to the horizontal stabilizer actuator. Checking with our accessory technicians, it was determined that we could repair the actuator the same day it was received. The stabilizer actuator was pulled by Carter on Thursday and arrived at Duncan Aviation on Friday. The unit was inspected, repaired and returned to service that same day then shipped back to Carter for delivery on Saturday. Carter reports the aircraft is now flying fine. Duncan Aviation autopilot technicians have seen the isolation diodes in the stab actuator fail before, and we are trained to assist in diagnosing this problem without having to pull the stab from the aircraft. We can provide one-day repairs on all Learjet stab actuators if we are given prior notice of the unit coming in. 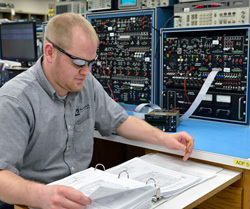 Contact Curt Campbell or an Accessory Technical Representative for troubleshooting assistance.